Radio Ronin starts off his set with Steppenwolf. Saturday night was one of the most active nights for pirate radio I’ve heard in some time. No doubt, pirates were taking advantage of the quiet atmospheric conditions. Radio Ronin was the first station I heard Saturday evening. His AM signal was very strong with only slight fading on 6,955 kHz. The mix includes mostly classic rock, starting things off with groups like Steppenwolf, the Steve Miller Band, and Pink Floyd, then moving into rock music of the 80s and beyond. I also included a few minutes of his interval signal (yep, even pirates have interval signals). This entry was posted in Broadcasters, Pirate Radio, Recordings and tagged Pirate Radio, Pirate Radio Recordings, Radio Ronin, Radio Ronin Shortwave, Recordings, Shortwave Pirate, Shortwave Pirates on September 24, 2012 by Thomas. 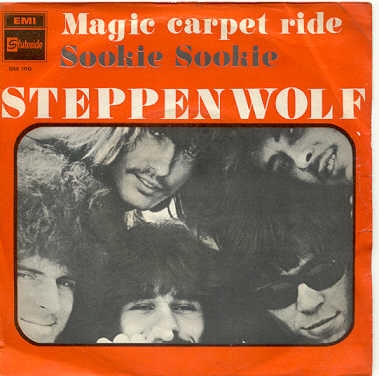 That’s a cool posting, but I don’t know if that photo is Steppenwolf – it looks more like Derringer! I like the interval signal! Yes, Radio Ronin’s interval signal is a very catchy one. I’ve been humming it most of the day.